Ever wonder what Calvin and Hobbes would look like as adults? One particularly inspired vision pits Christopher Robin and his friendly bear against our favorite comic-strip characters, in an eternal battle between good and evil. 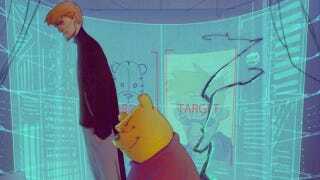 Take a look at the evil Dr. Christopher Robin and his nefarious Pooh creature, versus the grown-up spy duo of Agent Cal and Agent Hobbes. Created by artist Coran Stone, known as Kizer on Deviant Art, this epic clash of the formerly young boys and their imaginary friends is bleak and brilliant. Here are a couple images along with the run down created by Kizer, which also explains Christopher Robin's fall from grace. As children, these two had constant feuds after Calvin literally stepped into Christopher's neck of the woods. That's when the Battle began, the test of their imagination. Calvin would talk about his "friend" and his abilities and Christopher would counter and say "but can he..." it went back and forth between the 2 of them. As they grew older they grew in different directions. Calvin met new people and made friends – although his best and imaginary friend "Hobbes" stayed with him all the way into adulthood. Christopher on the other hand became more introverted but made the characters he invented as a kid more a part of his character as he got older. Christopher Robin had to leave for boarding school after being accused of burning down the 100 Acre Woods. Later ol Chrissy boy learned that someone saw a stripped shirt, wearing kid also wandering the woods on that very day. Turns out that Calvin who was fond of playing with matches at the time [and] burned down most of the woods by mistake – Chris got the heat though. This needs to be an animated series. Thank you for the tip, DasStan.